As pre-event testing wrapped up Emerald ahead of this weekend’s penultimate round of the Australian Kart Championship, visiting drivers were full of praise for the newest addition to the schedule. Given the fact that very few of the 220 competitors have intimate knowledge of the characteristics of the 1005-metre circuit, many of them took to the circuit for unofficial practice last weekend. One such driver was former Australian Champion and last round winner Jason Pringle. He believes the circuit layout will produce some exciting racing. “It’s a pretty good track and the racing is going to be fast. In the KZ2 class we’re exceeding 140 km/h so it’s one of the fastest tracks we’ll go to all year,” said the Victorian. “The circuit was fun to drive around and there are a couple of passing of opportunities that should produce some exciting racing. “It is quite technical from the engine and kart set up side of things while you try to balance high speed versus low speed cornering. Maintaining the tyre grip over longer runs while making sure they don’t overheat will also be a challenge. “During testing the grip level really seemed to build up but the times dropped away a bit in the middle of the day due to the heat. I think it all bodes well to being a good challenge for all of the competitors. Patrizicorse Team Principal Michael Patrizi echoed Pringle’s thoughts. “I’ve been to karting circuits all across the world I came away from the weekend very impressed by the Emerald facility,” said Patrizi. Emerald Karting Club President Michael Rolfe has been pleased by the positive feedback from the drivers and teams. 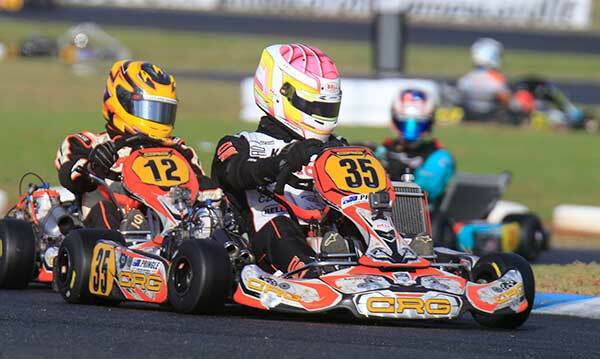 “To have so many drivers and teams impressed by our facility is fantastic and as a Club we’re honoured to be able to host such a prestigious event on the Australian karting calendar,” said Rolfe. Official practice kicks off this Friday morning with qualifying and the heat races contested from 8am on Saturday ahead of the finals on Sunday. Admission for spectators is free. The Emerald kart Circuit is located behind the Ag Grow Fields on the Capricorn Highway.